Dashboard gives you basic overview of all your proposals and client activities like viewing, approving or commenting proposals. You can display all the info or just proposals that belong to you or one of your colleagues. Get a quick overview how the sales process is working by looking at the charts. Charts can display either quantities or value or proposals. See who, when and how long viewed your proposals, also keep track of the latest comments from your prospects or clients. The search bar at the top of each page allows you to get to any of your proposals or clients from every page in our app. Switch the dashboard to display all proposals, or just the proposals created by you or one of your coworkers. The editing process couldn't be more intuitive. It's a true WYSIWYG form of editing, no need to click back and forth between preview and editing. Use predefined ([ClientFirstName] etc.) or your own custom tokens ([my_token_abc] etc.) inside the text of a proposal or in email templates. You can upload images and place them in the proposal, also you can upload and link PDFs or other files to proposals. You can prepare text templates that will save you a lot of time. Text block library is another way to compose a proposal from smaller pieces. Use optional items to sell more services and reduce redos and unnecessary communication with clients. You can make some or all optional items pre-selected by default if you wish. Choose one of our many ready-made responsive (mobile-friendly) themes or create your own theme by modifying our theme or start a new one from scratch. The ready-made theme doesn't match your company colors? Just recolor it - change the color of the background image, headlines etc. Easily prepare reusable proposal templates for your services or products. 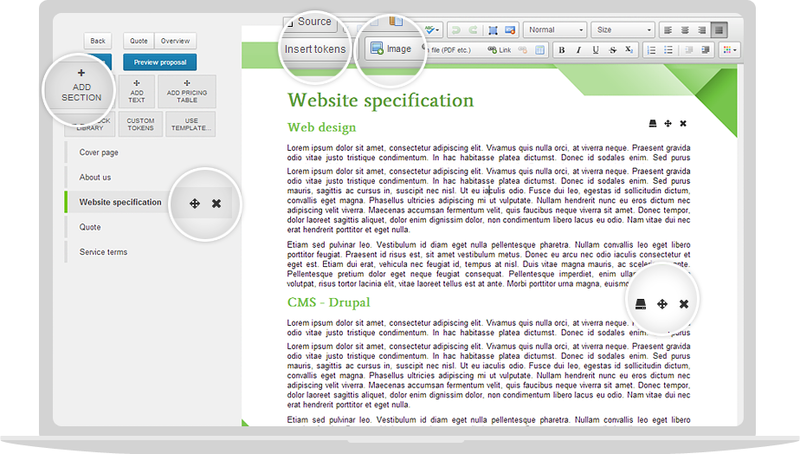 NiftyQuoter uses three kinds of proposal templates: theme, content and pricing templates for the highest efficiency. Replaceable tokens in text templates are also supported. No need to download PDFs and attach them to emails manually, just send them right from NiftyQuoter. You can prepare multiple email templates for different services you offer or for a different stage of a sales process. A PDF is generated automatically by NiftyQuoter. You or your clients can display it right in the browser or download it. Your clients can approve or reject a proposal easily, you can customize messages they see before and after an approval, so they know how the sales process will continue. You can provide your "terms of service" text that will be displayed in an approval form. You can see the activity of each member of your sales team. NiftyQuoter supports two types of roles: managers can do everything - for you and your business partners, or create a sales role for your employees. You can use a relative (%) or absolute ($) discount for the whole quote and/or set different discounts for each quote item. You can split your quotes into different groups (e.g. Implementation, SEO, Marketing etc.). If you use groups in your quotes you can also enable subtotals so that your clients can easily see the costs of each group. You can require your clients to sign a proposal approval by typing their name and/or drawing their signature by a mouse. Track all the views of a proposal. See when and how long your prospect viewed a proposal or downloaded a PDF version of a proposal. Client side texts (approve proposal, reject proposal, etc.) can be translated to another language or just customized to your needs. That means you can use our proposal software even if you don't send proposals in English. You can even add multiple languages. Save text blocks for reuse, then just drag and drop them to another proposal. Use tags to organize your library. You have the ability to let your clients change quantities of line items in your proposals. We use strong 256-bit SSL (HTTPS) security to make sure nobody looks at your communication with our cloud servers. In addition to predefined tokens ([ClientFirstName] etc.) you can also define your own tokens. Use them in your text templates and then just fill in their actual values when creating a proposal. You can set up sending custom emails automatically to you or your clients for example 3 days after a proposal was sent or viewed. You can prepare various reasons for rejection and your clients will be able choose their reasons. They can also fill in custom text field. You can send HTML emails (emails with images and text formatting). You can also enable email open tracking via the transparent image technique. You can export and import product templates. Can be very useful if you're selling a lot of different physical products with changing prices. You can set an expiration date so your clients won't be able to approve proposals after that date. However they will be able to easily request an updated proposal by clicking a button. "We took a number of different platforms for a spin before selecting NiftyQuoter, and we made the right decision. NiftyQuoter offers Roadpost the ideal mix of flexibility and ease of use, and the customer support and responsiveness has been tremendous. NiftyQuoter’s impact on internal productivity has been immediate, reducing the time it takes to generate a proposal from 20 minutes to less than five. Most importantly, we’re presenting a much more professional face to our prospects, have more back-and-forth dialog with greater insight into what happens on the client side after sending the proposal, and are closing more opportunities." "We trialled nearly all of the online proposal apps and fell in love with NiftyQuoter because it has the most powerful customisation tools, which is very important for our business image. Not only that, but the customer service has been truly outstanding; the owners truly take the time to listen to their users and act on it, which is really rare in this day and age. It already has a fantastic list of features and I look forward to watching it grow. Oh yes, and it has made proposal writing fun for us!" "After signing up for multiple quoting/proposal based software trials, we finally found our favorite system Nifty Quoter! The system has met our needs and continued to meet new needs as their company develops new features and updates to their system. We love how we can whitelabel proposals and URL’s for our clients." "You guys are awesome! We love your company, great software with great people behind it." "An intuitive, customizable and user friendly system with fast and efficient support. With NiftyQuoter we maintain absolute control of ongoing proposals. Thank you for making our job easier. Many thanks!" 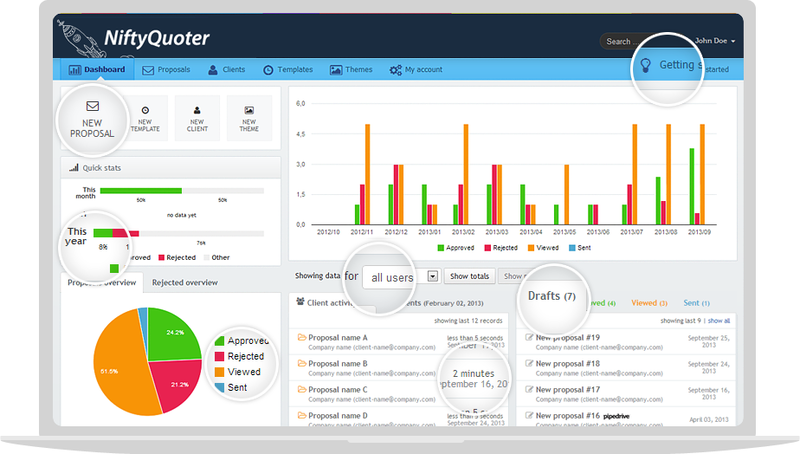 "NiftyQuoter is an efficient, flexible and powerful online tool for managing proposals. My customers are already asking us how to implement it in their companies too. Congratulations to the NiftyQuoter team."